Please tell me what is better than a cheese platter turned into a dessert? I can’t think of much that can beat it. For a long time I have been thinking about making a Blue Cheese and something ice cream but I put it on the back burner for whatever reason. A few weeks back I was flipping through the Momofuku Milk Bar Cookbook and saw the Chèvre Frozen Yogurt (pg 217) recipe and which re-inspired me to make a blue cheese frozen treat. Since I was quite busy when the idea came back to me I figured I would make it for the Bastille Day Picnic I was trying to plan with some friends , as I talked about here, but alas schedule conflicts came up and that fell through. So this past weekend I thought it would be the perfect time to finally make it as I had been collecting all the components over the past week and there was the massive heat wave there is not much else I wanted to cook. When it is 90 + degrees and humid the last thing I wanted to do was turn on the stove (you can tell in my photos that my frozen yogurt was getting a little bit melty) . So Ice Cream (well frozen yogurt but whatever) it was. This Frozen yogurt is nice and tangy which makes the pear and honey a nice accompaniment to the tangyness and would be great served as a first course cheese course replacement but is also great as a desert course ( or heck as a meal on its own… not saying that’s how I ate it or anything). Pre-heat your grill pan or grill until it is very hot. Place your pear slices onto the grill and grill until nice grill marks start to form then flip until the other side has developed the same marks. Scoop out your ice cream (1 or 2 depending on how large you want the desert to be) on to the pear slices or if you want to be fancy you can make a Quenelle (that fancy shape you get at a fancy place). 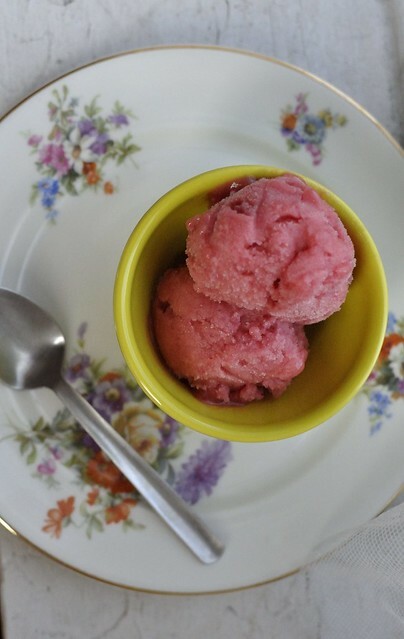 This recipe was adapted from Momofuku Milk Bar and like my Rhubarb Sorbet it uses corn syrup (or glucose) to help stabilize it and keep the liquid from crystallizing to much and helps create a good mouth feel. The Gelatin used helps do the same thing and keeps the frozen yogurt from freezing to hard or melting too quickly. When making this Frozen Yogurt make sure to pick out a cheese you really like the flavor of because this is an intensely flavored ice cream so you want to use a quality good tasting product. Bloom your sheet Gelatin by soaking it in a small bowl of cold water for about 2 minutes. It should get soft but not so soft that it is falling apart. Squeeze out the extra water and place in your mixing bowl. You can read up more about gelatin at Modernistpantry.com and purchase the gelatin sheets there as well. Lightly heat some of the milk and whisk in the gelatin sheet until it is dissolved. Add to Gelatin/ milk mixture to blender along with the remaining milk, Buttermilk, Blue Cheese, Yogurt, Corn Syrup, Sugar, Salt, and Citric Acid. 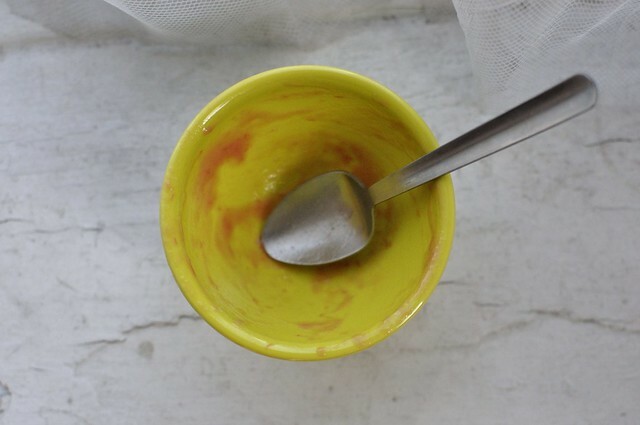 Pour the frozen yogurt mix through a fine mix strainer into your mixing bowl. Once spun I like to let my ice cream set for about an hour or two before serving so it can set up a bit more. You can serve though straight out of the machine or store for about 2 weeks. 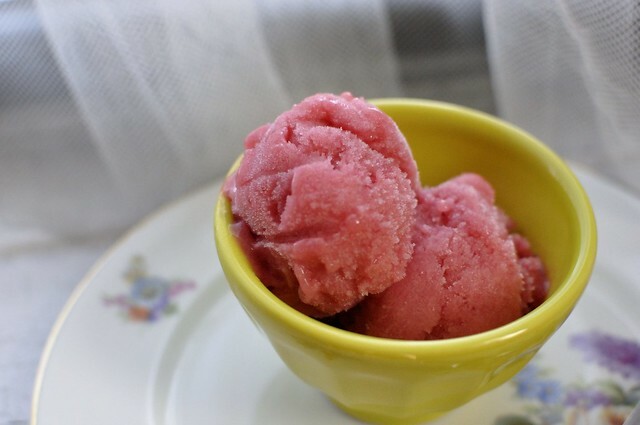 While browsing through my reader the other day I came across a recipe for Rhubarb Lime Vanilla Bean Sorbet from Susan Eats London and it immediately sounded interesting. What drew me first to the post was the short bit of information about using stabilizers to ensure your homemade ice cream and sorbet has a nicer texture which is something that I have been having a problem with. Going back through my books now though I realize that is why gelatin sheets and glucose are used in the Milk Bar recipes (which I have a grand idea I am going to make in the near future that uses one of those as the base). Also I have always wanted to try making something with Rhubarb since my experience with it has been slim and I did not want to make a pie. So when I was checking out a newer grocery store in the city (Union Market @Houston & Essex/ Ave A for any New Yorkers) and saw some great looking rhubarb which I had to get to make sorbet since the idea had been floating around in my mind. When I got home to make the sorbet base I decided to wing the flavoring with what I had on hand and not go out an buy a vanilla bean for this. Since I had rose water I added a bit of that in, as well as vanilla extract, and lime juice. Due to the rose water the final product has some nice floral notes but I wish that it had a bit more acid in it. If I am to make this again I would add more lime juice or take another page out the Milk Bar Cookbook and add a bit of citric acid for the acid note. In this recipe you can substitute the Corn Syrup with Pure Glucose if you have that on hand though you might need a bit less, taste and see, or any other inverse sugar syrup (i.e Golden Syrup) but regardless of what you choose do make sure to use one of the above this is what helps keep the sorbet from getting too crystallized and icy which often happens with homemade sorbet and ice cream. So get out your ice cream maker and whip this up right in time for these crazy heat waves that seem to be going on all across the country! Let cook for about 10-15 min or until the Rhubarb is soft. Take the mix from the heat and pour it into your food processor. Run the processor until the mix is smooth (alternatively you can use a hand immersion blender if you have one). Pour the mix out into your bowl and run through your sieve if you want your mix extra smooth, I skiped this step because I was okay with the mix as it was. Add in the Rose water, Vanilla, Lime Juice and Corn Syrup and mix until everything is combined. Move the mix to the refrigerator and leave until it is cool all the way through. Once the mix is cool (I left mine overnight) set up your ice cream maker and pour in the sorbet mixture. Run your machine per your manufacturer’s instructions. Once the sorbet comes together transfer into your storage container and let it set in the freezer. 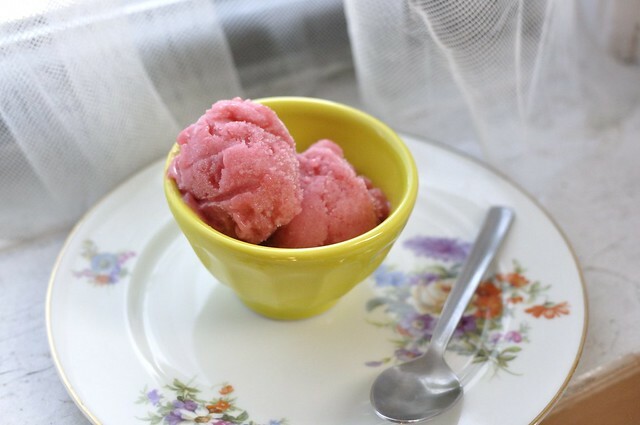 Serve once the sorbet reaches the desired consistency! This past week has been a long and painful one. It started with a great trip to Atlantic City for my sisters birthday but I managed to catch a bit too much sun at the beach and got the most awkward sunburn ever and I never used to burn… I guess I have been spending too much time indoors over these past few years that my body does not know how to react to the sun! Then on Thursday I managed to loose my wallet while taking my jacket out of my bag while crossing the street after work. I have dropped things on the street before and I have always had someone point it out to me but not this time. I notice when I was going down to the subway with the plan in my head to go to Whole Foods and get Mussels for dinner but the lack of money and a metro card but a huge damper in that. I still have not had anyone contact me about my wallet so I figure at this point it is as good as gone. Thankfully I had no cash in my wallet and the only real important thing I lost was my drivers license but I have a passport until I deal with getting a new one which is bound to be a big pain since I had a CA ID but I now live in NY…. but that is life I guess. So on Friday I decided to try again and went a bought Mussels to make for dinner. I really enjoy the simple preparation of mussels with white wine and bread so that is what I decided to make and while it will no bring my wallet back to me it did end my work week on the upside. So Next time you have a bad week maybe you will think about making this super simple recipe that is both fancy seeming and delicious. The perfect pick me up for whatever is keeping you down. In a large stock pot combine the white wine, 5 whole sprigs of parsley, Garlic, and Bay Leaves. Turn the stove on high and let the wine mix come to a boil and let it boil for a minute or two. Pour in the mussels and cover with the lid. Check to see if the mussels are all open and turn off the heat. If any mussels did not open throw those away. Serve portion mussels into 2 large shallow bowls and pour over the mussel broth, garnish with parsley and serve with bread. In the past month I have grown a small obsession with everything Hawaiian. I think it started with reading the article in the newest Lucky Peach (Issue 7: Travel – Spring 2013) “Things Were Eaten Part Three: Hawai’i” which follows Ray Choi and Christina Tosi as they eat their way around Hawaii. The idea to make Hawaiian inspired food and have a Tiki Hawaiian Luau themed party have been floating around my head for a while but the Lucky Peach article I think was the catalyst for actually making something. For now I just made sandwiches I think it would be really fun to have a Tiki Luau party this summer with all sorts of Hawaiian inspired food and Hawaiian Bark Cloth clothing… We will see if that actually transpires but until then tasty food is good. After pursuing the internet for some cooking inspiration I decided that I wanted to make Hawaiian inspired pulled pork sandwiches. Since a large portion of the Hawaiian population is of some sort of Asian decent I decided to go with a bunch of Asian flavorings for the pulled pork. When you look at the below ingredient list for the pulled pork you will see that there is a lot of ingredients that may not be common to an American refrigerator but everything I happened to use were things I had on hand. Feel free to substitute as desired but I think the particular mix of sauces and Miso that I used create a nice body of flavor and pretty much everything should be available at your local Asian food store or a specialty market. For the sandwich rolls I wanted to go with a sweeter Hawaiian roll that uses Pineapple juice as one of the ingredients which makes for a good balance to the salty savoryness of the pulled pork. We are just making a sandwich nothing special here… Cut your just baked bun in half and put your Mayonnaise on both the top and bottom bun. If you wish put a few slices of Avocado on the bottom roll (I highly suggest this it adds a great depth of flavor and richness to the sandwich) put the pulled pork on top and sandwich with the top roll and serve! Ideally you should purchase your Pork Shoulder at least a day in advanced of when you plan on cooking it. When you get it home salt it liberally then wrap tightly and store in the refrigerator until you are ready to use. By salting in advance you make sure that the meat is well seasoned and it helps break down the tough muscle tissue a bit which will make a more succulent pulled pork. On the day you are going to make your pulled pork take out your Pork Shoulder and let it sit out for an hour or two to come to room temperature. This helps the meat cook more evenly. While your meat is coming to temperature grind up your White Peppercorns and Szechuan Peppercorns. You can just use regular pepper but if you have access to white pepper and Szechuan peppercorns they add a nice depth of flavor to the finished meat. Cook at 200F for 6-8 hours until cooked through and you are able to pull it apart with a fork. When the Pork is cooked through and tender take the meat out of the pan and let rest covered on a cutting board for about 30 min to an hour. In the medium sauce pan add all of the remaining ingredients except for the Dark soy Sauce (Worcestershire Sauce, Fish Sauce, Shiro Miso, Red Miso, Sake, Rice Vinegar, Sriracha, Sambal Chili Paste) and heat on low. Mix until the Miso Paste is dissolved and the mixture is warm, then turn off the heat. Now that your Meat has rested pull it into shreds using two forks. One to hold the meat and one to shred with. Take all the shredded meat and mix it into the sauce you just created, making sure to incorporate all the sauce into the meat. Finish with a bit of Dark Soy Sauce to your taste and to supplement the moisture of the meat mixture. I used the Hawaiian Sweet Roll Recipe from i heart eating for my Hawaiian Rolls with a few adjustments. Mine did come out a bit dense and I think there are 2 factors for that one is I halved the amount of Yeast used because 2 packets seemed excessive and I did not wait for the Pineapple juice to come to room temp so the yeast did not bloom properly. I would suggest to follow the recipe as is but reduce the sugar to 5 Tbsp total so they are not so cloyingly sweet. I want to work on perfecting my version so for now follow i heart eating’s recipe and just form them into 10 Sandwich rolls instead of 20 dinner rolls. I made this recipe because I signed up to be a tester for the weekly recipe contest on Food 52.com. 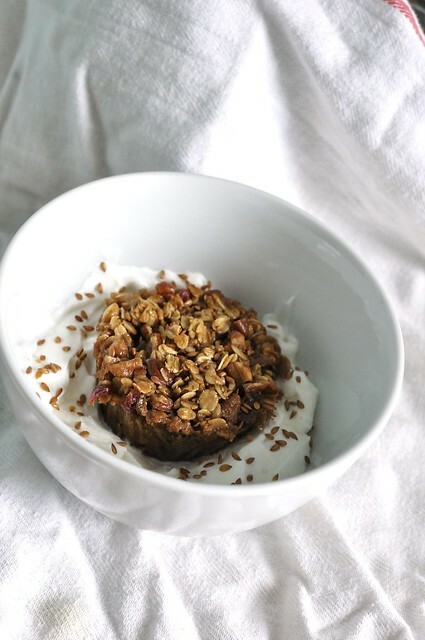 The entry for Maple Espresso Baked Oatmeal sounded delightful and the perfect accompaniment to my morning greek yogurt so I decided to volunteer to test it. 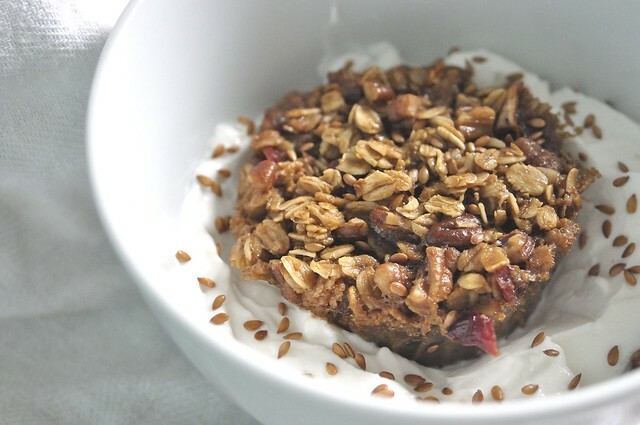 I really enjoyed the results of the recipe and I would suggest it to anyone wanting a quick and tasty addition to their breakfast. I followed the recipe pretty much to the T the only changes were I used dried cranberries and cold eggs I did not see why the eggs needed to be at room temperature and it turned out just fine with the cold eggs. I also used a half and half mixture of Syrup and Honey since I ran out of syrup which still yielded a just sweet enough final product. I really enjoyed the results of this recipe and will defiantly be making it again with a few modifications and additions. 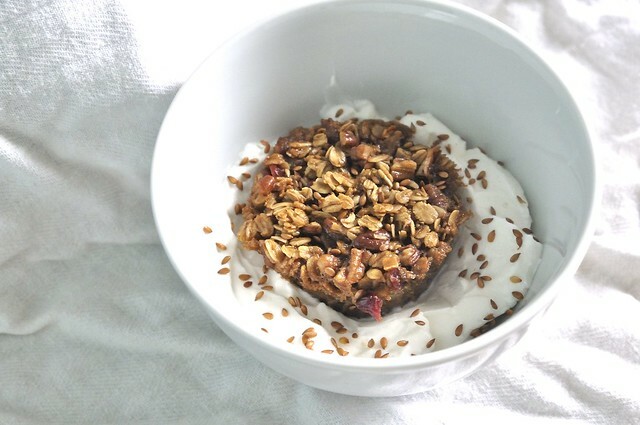 I plan on adding some Flax Seed, Wheat Bran, and Sunflower Seeds to make it extra nutritious and tasty. This past weekend I went to my friend’s apartment for a lovely little brunch. I was in charge of bringing bread and cheese as we were having a spread of starters and some other food for the main. Since I wanted to bake something but did not feel like making bread I decided to make scones. 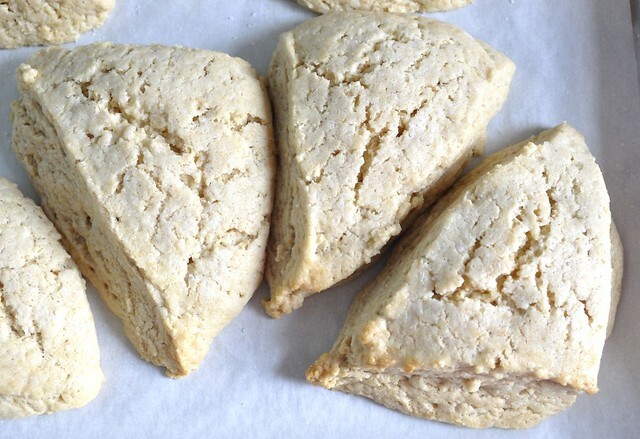 While looking for recipes I found the recipe for Plain Scones in the Bouchon Bakery by Thomas Keller & Sebastien Rouxel cookbook. I love the book everything looks amazing but of course since it is such an elevated cookbook a lot of the recipes take more time and effort than I usually have for baking. 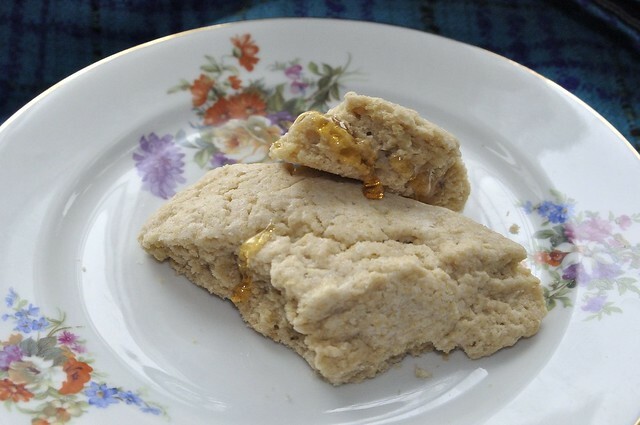 But as everything is so lovely looking I always go back to the book which is why I found the scone recipe and while it was different than every other scone recipe I have seen it was not so complicated/ labor intensive that I decided to try it. I thought the method was very intriguing and now that I have tried it I am very happy with the results. 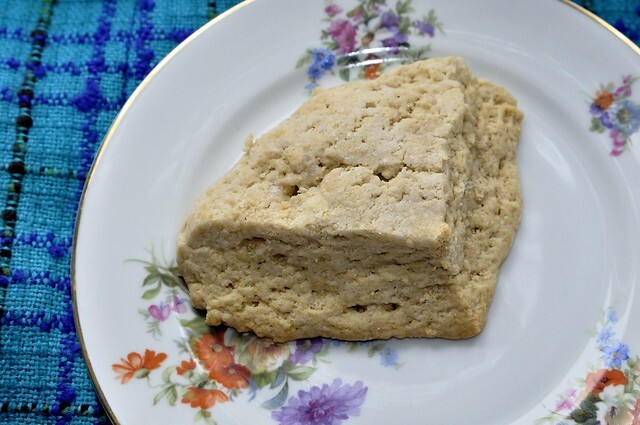 You make a rather wet dough which you refrigerate until it it is hard enough to cut into scones and then you freeze them at least overnight and then cook from frozen. I defiantly plan on making these again maybe with basil and sun-dried tomato… I am really interested in making more savory scones but I am sure I will make some traditional and my favorite cranberry orange scones too. I followed the recipe to almost a T but when I was at the grocery store buying supplies I did not buy enough Heavy Cream to make Creme Fraiche and use in the dough so I subbed buttermilk for Creme Fraiche. This made the scones a bit more tangy than I think they would have been otherwise but they were still good. I also think that since I used so much buttermilk I should have added a bit more baking soda to balance out the acid but otherwise they were the most moist and perfect scones I have ever made. The recipe takes longer to make than a regular scone recipe because you freeze (as I talk about above) but is so worth it. 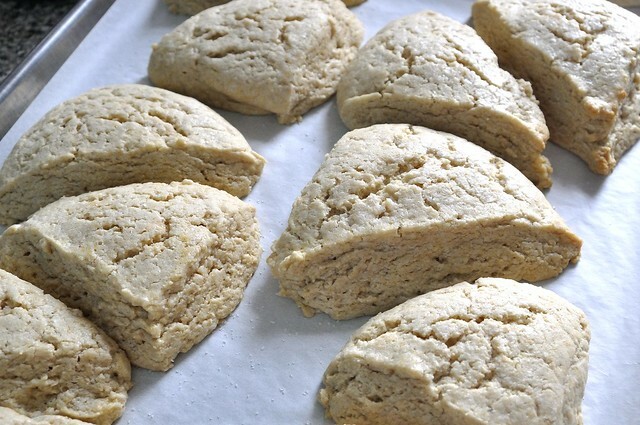 Because you freeze it though it makes the scones great for making ahead of time and cooking right before eating and you can keep the dough frozen uncooked for up to a month. I think they are great just served plain or with butter, honey, and preserves. I always fine that my best ideas come to me at the most random of times, like this one for Mini Mexican Chicken Pot Pies. 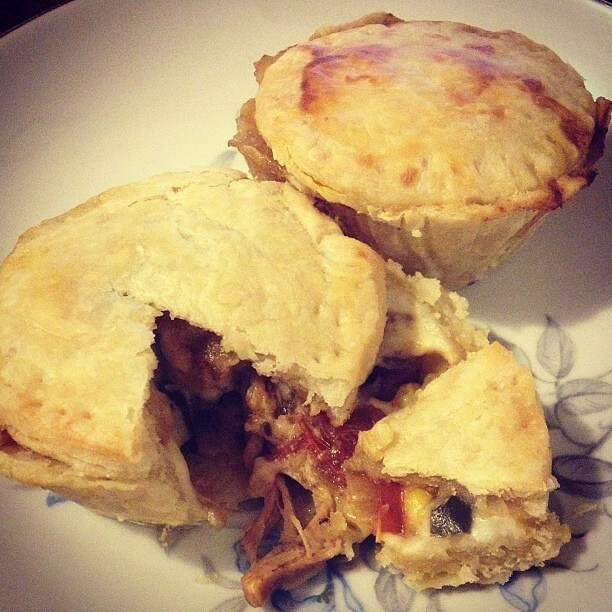 I had been fixated on pot pies for a while for some reason which I thought was weird because I have never been a big fan but one day, probably while browsing the internet, the idea popped into my head to make Mexican chicken style pot pies. Since my go to chicken prep is some version of my Taco Truck Chicken I thought it would be great to use some version of that as the filling for the pot pie, I jotted this idea down in my notebook and that was that I figured I would get around to making them you know someday… So this past weekend when I was going through my cookbooks looking for some pulled pork inspiration and came across the pot pie recipe in Ad Hoc at Home by Thomas Keller and decided that I was going to try out my chicken pot pie idea right there and then. I set off to the grocery store which is were the mini idea came about. I was looking for small pie pans, because I was only cooking for my self I did not want to make a giant pot pie that would be too much for one serving and would not save very well and of course the grocery store did not have small pie tins (I was basically looking for tart pans) but they did have muffin pans which is when it hit me that making mini pot pies would be perfect (which they were). Using the muffin pans meant that the pies could easily be portion controlled and the leftovers can be frozen for a quick dinner or lunch for another day. While the inspiration for this recipe came from Ad Hoc in the end I did not use any part of the recipe from the book, I only used it as a guide for the parts needed in the final pies. All in all I think these Mini Pot Pies turned out great and while amazing as a main dish they would be also be a super great appetizer for a dinner party! In each mini pie put about a Tablespoon of corn you can put more or less to your taste. On top of the corn add in your chicken mix to each cup until the cup is filled to the top. Pour or spoon over the chicken enough of the bechamel so that it comes almost to the top of the cup, making sure that it does not over flow. 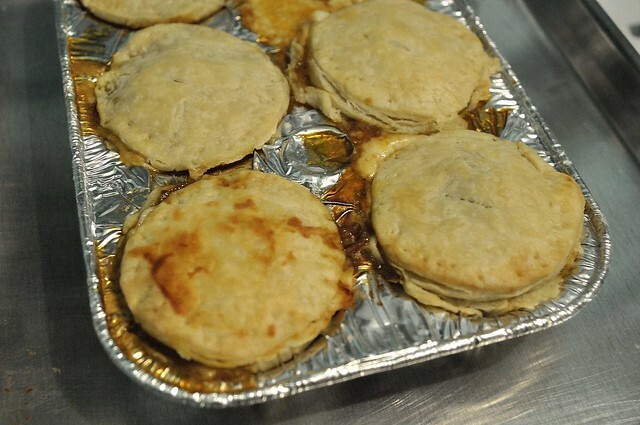 Take the rounds for the tops of the pies out of the refrigerator and place one on each cup. Remove from the oven and cool slightly and serve! You can store any left overs in a plastic bag in the refrigerator or freeze them for another day! This recipe is a modified version of my basic Taco Truck Chicken which is my go to chicken preparation it is easy and so versatile. This version is not as spicy as the basic version, in fact is not really spicy at all the poblano pepper adds a lot of flavor but is not spicy pepper. While the liquid is reducing, shred the chicken using your fork. Once the liquid has reduced down to about a quarter of the original volume add the chicken back in and mix together. 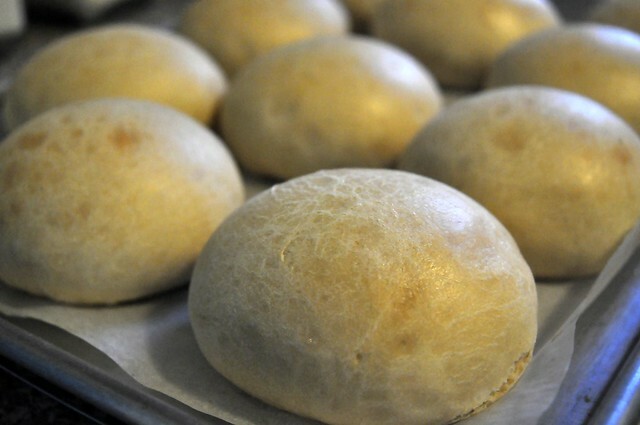 Once the dough is cold again take out one of the disks and roll out until it is about 3/8″ thick. 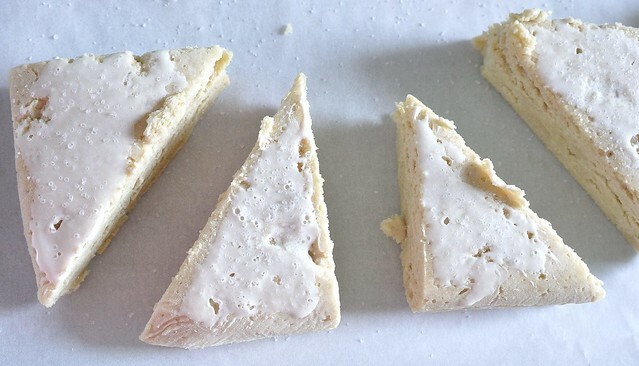 Take your biscuit cutter and cut as many rounds as you can get out of the dough. Re Roll out the scraps and Cut as many more Circles as you can get. The one disk should yield about 12-13 rounds. Place the rounds back in the refrigerator and repeat with the second disk. Take the first 12-13 rounds and roll each one out a bit more until they are about 1/4″ in thickness. These will be the bottom of the pot pies. Return to the refrigerator until ready to use. Take the second set of rounds and roll out just so they are big enough to cover the top of the muffin tin for the pies. Once rolled out return to the refrigerator. I followed the recipe in Mastering the Art of French Cooking and while I could never do as good as a job of explaining how to make a bechamel as Julia Child and crew can I have given my own version of the directions below but If you really want a through and complete explanation defiantly check out the book. 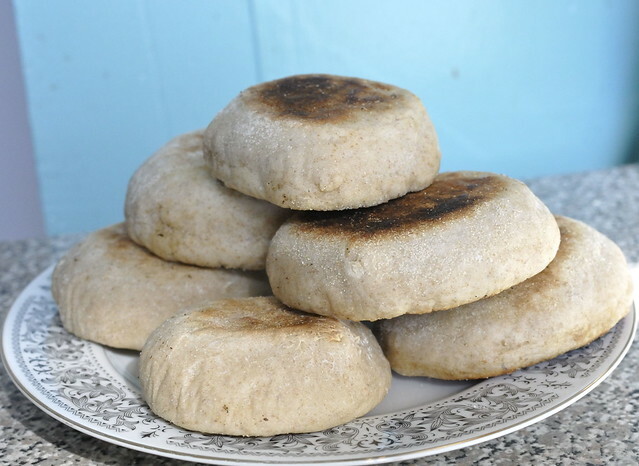 I have always loved english muffins, they are a staple of my breakfast routine but I never thought about making them until I started seeing a bunch of different recipes and posts on tastespotting and foodgawker. I figured if I make my own bread why don’t I make my favorite breakfast counterpart. After much perusal of recipes I finally decided upon making them using this recipe from Little B Cooks as my guide, I only slightly modified the recipe by switching out some of the all purpose flour for rye flour since I had it around the house. As I usually buy whole wheat muffins I figured this was a good way to add a nuttiness with the flour that I had on hand since at the time I did not have any whole wheat flour on hand. On my first attempt the muffins ended up being quite large, so when I decided to make them again this week I was careful to make them smaller. On my attempt to make them this week ,due to rushing in making them and not following my instincts, they came out a bit doughy. The batter was too wet but since it was late at night my normal instinct to add more flour decided not to show up for the party and I proceeded as they were. So when I made them and cooked them they were still doughy… It was quite a fail but it was just another lesson in not rushing when cooking and don’t try to make bread at night…. Regardless of my fail on my second batch of muffins I still made a great breakfast sandwich, which is one of my favorite preparations of an english muffin. 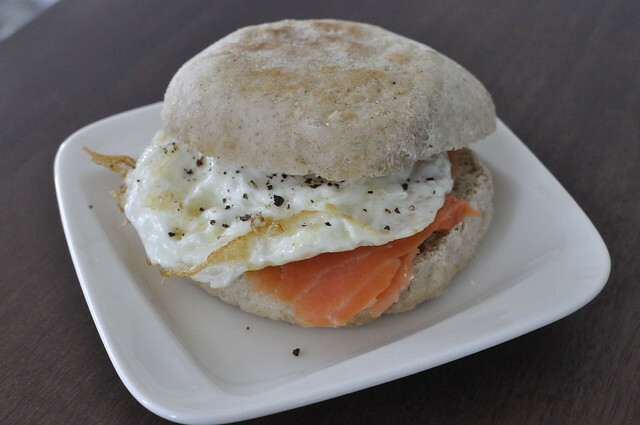 With my first muffins I made a fabulous smoked salmon and fried egg sandwich, which I must say there is nothing better than a breakfast sandwich on home made bread. 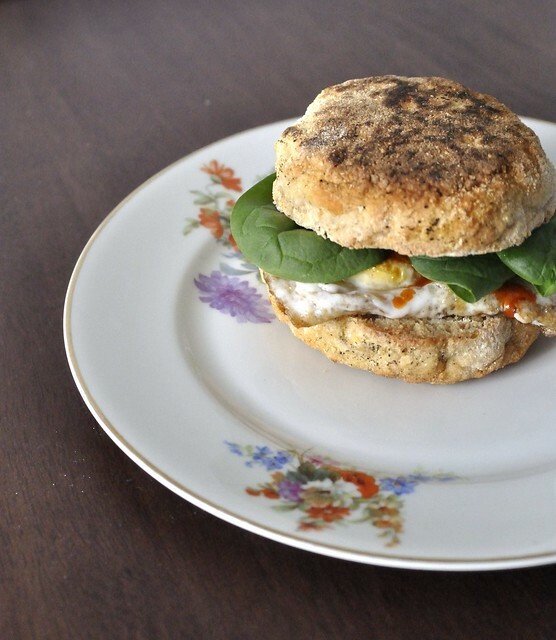 With this most recent doughy batch, I extra toasted the muffin and made just a simple fried egg and spinach sandwich which was still good even if a bit chewy. Of course a great simpler preparation is to toast the muffin and serve with butter and preserves or a nice Grapefruit or Lemon curd (my favorite thing to make with left over egg yolks from Macaron making). All in all I think English Muffin making is going to slowly become a bigger part of my weekend cooking routine so that I have the time to make them properly and then I can have them for breakfast all week.